Digi-Schlock: TERRORVISION/THE VIDEO DEAD (Scream Factory Blu-Ray/DVD Combo Pack) – Schlockmania! Though it has made its name with deluxe editions of famous horror and sci-fi cult favorites, Scream Factory is quickly expanding its profile by moving into the more obscure corners of the catalog title world. 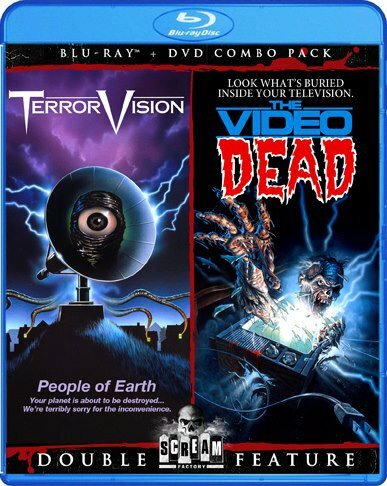 Their new double-feature set of Terrorvision and The Video Dead is an impressive example of their work in this area. This savvy pairing of two t.v.-themed horror favorites from the VHS era gives the films a serious upgrade in transfers as well as a hefty stack of extras. Both films have been given new anamorphic, high-definition transfers that will impress fans who became used to watching these films on VHS. Terrorvision is particularly impressive, with the sleek photography and the vivid color scheme of the production design popping right off the screen with a new level of clarity. The Video Dead has a rougher, low-budget visual style but it looks good here, with appropriate film green and a sharpness of detail that was never seen in its videotape incarnation. In terms of audio, both films feature their vintage 2.0 mixes as well as new 5.1 remixes, with all options presented in a lossless format on the blu-ray. The 5.1/lossless options were utilized for these reviews and both sound quite good: dialogue is clear on both, surrounds are used subtly but effectively and the electronic-layered musical scores get a boost in depth from the remix. Each film also features an array of special features, most of them produced especially for this disc. 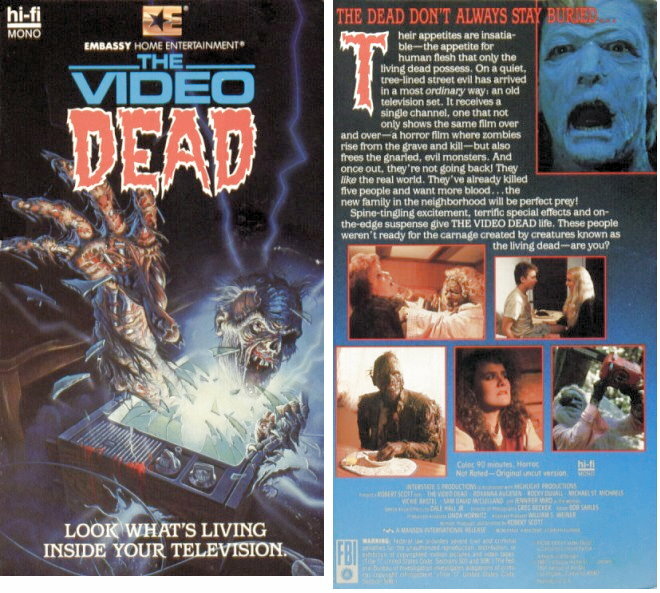 Fans of The Video Dead will be surprised to see this cult favorite got not one but two commentary tracks, both moderated by superfan Chris MacGibbon. The first features writer/director Robert Scott, editor Bob Sarles and FX man Dale Hall Jr. while the second track features cast members Roxanna Augesen and Rocky Duvall, production manager Jacques Thelemaque and FX men Patrick Denver and Hall. The first track is the best as Scott is able to go into the hows and whys behind his choices, with his cohorts adding interesting technical details on their work. The second track is more raucous and unfocused but has the occasional nugget of interest for fans, like Duvall’s memory of how he attended an audition for the film over the objections of his high school drama teacher(!). The Video Dead extras also include an original theatrical trailer, just under two minutes of outtake footage (mainly slates & behind the scenes stuff) and a featurette about the makeup effects. The latter segment is entitled “Pre-RecorDEAD” and utilizes interviews with Hall and Denver to discuss their work. Both are proud of what they accomplished on a short schedule – they had only two weeks of prep time – and go into detail about how the zombie makeups were achieved and specific shock moments, like the chainsaw zombie dismembering scene. Hall also relates a particularly funny anecdote about a doing a cast on a female cast member. Terrorvision‘s extras are smaller in number but potent. The first is a commentary track that pairs writer/director Ted Nicolaou with stars Diane Franklin and Jon Gries. It’s a very scene-specific track, with Nicolaou laying out production info while Franklin and Gries offer appreciations from the actors’ perspective. A lot of the big points they make overlap with the featurette but they have a humor-filled camaraderie that makes the track a pleasant listen. The commentary is pretty decent but the featurette for Terrorvision is even better: “Monsters On Demand” is an expansive 34-minute retrospective that includes everyone from the commentary plus actress Mary Woronov, producer Charles Band, FX man John Buechler and more. The anecdotes move at a nice clip, deftly intercut with clips from the film as the participants describe the film’s poster-inspired genesis, the relaxed charm of shooting a film in Italy and the reasons Terrorvision was essentially buried during its original release. It all adds up to another strong featurette from Red Shirt Pictures and the kind of thing that any cult film fan will enjoy. The package for Terrorvision is rounded out by an image gallery that includes stills, behind the scenes photos and promotional art. Like the film itself, the images are colorful and wild. All in all, this blu-ray/DVD set offers a generous and technically-impressive package for two films that most genre fans would have never expected to get such a treatment. It’s another fine edition for Scream Factory and will leave fans hoping that they continue to give genre rarities this kind of attention.